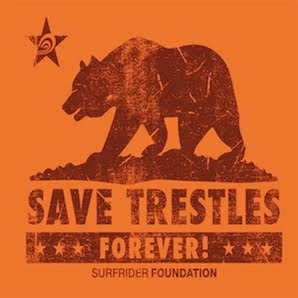 Save Trestles: Quick Updates about Trestles Campaign. Quick Updates about Trestles Campaign. We still haven't heard any word about how the Federal government will rule regarding the appeal of the California Coastal Commission decision. Remember, the Secretary of Commerce must decide between Oct 24, 2008 and - Jan 7, 2009. Therefore a decision will be made before Obama takes office. While we're waiting, we are far from idle… the Surfrider Foundation is continuing our public outreach. This weekend (Nov 7-9) we will be down at the Oxbow World Longboarding Tour at San Onofre State Beach educating the public about the proposal to build a toll road through this precious park. This surfing competition brings the world's 48 best longboarders together. Come check out the surfing and stop by our booth to say hi! We will also continue the annual tradition with the South Orange County Chapter of Surfrider by hosting another holiday party to raise awareness and funds for the Trestles campaign (more details to come soon). Finally, the Save Trestles campaign will receive a Recognition Award from Convicted Artists at their Extreme Sports & Artist Charity Event. Over the summer, the Trestles campaign also received a Special Recognition Award from Surf Industry Manufacturers Association for our work to stop the toll road. We are extremely honored to receive such accolades! Thanks for the update. Its exactly the info I was looking for. Thanks for your informative blog! Your article helped me to understand the future of programming language. Keep on updating your with such awesome information. Thanks again. I was looking for tips on how to write an essay and accidently found a tool which generates thesis statements. So, I decided to share it with you because I know that many of you would like to have this thesis creator . Students need to help each other, don’t we? Your blog website provided us with useful information to execute. Welcome to the website where you can order an essay of high quality. Only at our online writing service, you will be able to get necessary essay support and assistance from our highly experienced, professional, and well-educated academic and custom writing gurus!